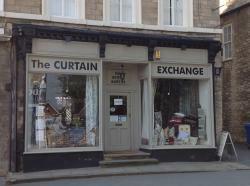 The Curtain Exchange in Yorkshire is well established and has a very wide selection of curtains and accessories. Our bespoke made-to-measure range is constantly changing in order to reflect new concepts as well as providing beautiful silks and chenilles. We can arrange for a professional curtain fitter to measure and put up tracks, boards and poles. Our second hand collection is extremely good value and includes a varied range of long curtains for large Victorian windows. Boston Spa is a pretty village with a number of independent specialist shops located two miles from the A1 near Wetherby. Easy access to parking is available nearby. Follow us to keep up to date with The Curtain Exchange.